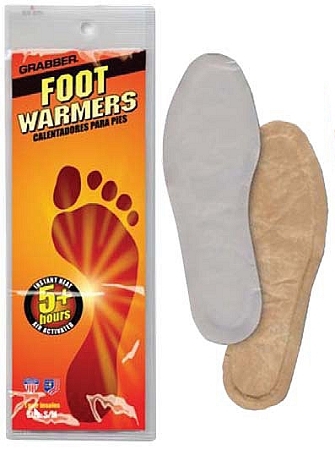 Grabber Foot Warmers are thin, comfortable, air-activated insoles that fit in your shoe or boot. They provide over 5 hours of soothing warmth beneath your feet. 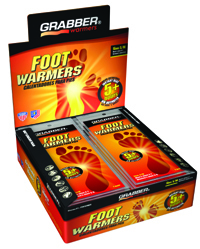 The latest addition to the best-selling Grabber line, Foot Warmers contain a revolutionary warmer technology. Grabber Warmers are widely used for portable, long-lasting heat therapy for those who suffer from painful feet and toes as a result of Arthritis, Raynaud's, Lupus, Scleroderma, Sjögren's, Myalgia or just poor circulation. 2 Warmers per package. All Grabber Warmers are designed for one-time, disposable use. Case of 240 pair: 8 display boxes of 30 pair each.